The best factory bolt-action hunting rifle just got better. The X-Bolt Hell’s Canyon Speed rifle is built to exceed your accuracy expectations, straight from the box. The action and stiff, fluted barrel are bedded and free floated to ensure straight shooting. MSRP for this rifle is $1,229.00. Softer shooting and tougher than ever. The muzzle brake reduces felt recoil and is easily removed and replaced with an included thread protector. In place of traditional blueing, a Cerakote Burnt Bronze finish was chosen. Not only does it look great, the flat finish aids in concealment. Cerakote is also tougher than other firearm finishes to keep this rifle looking its best for years to come. The X-Bolt will be available in 6.5 Creedmoor. 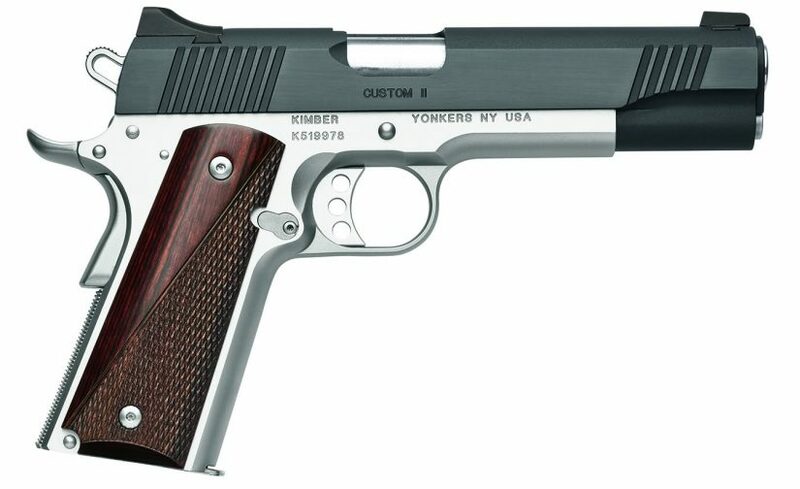 One of the finest all-around pistols available from Kimber, complete with a brushed polished carbon slide, stainless frame and rosewood grips. The Custom II Two-Tone features an extended beavertail grip safety for fast, positive operation. The 5-inch match grade barrel and bushing equates to unequaled accuracy, and behind its beautiful appearance, the full-size stainless steel frame is machined from a solid steel block to increase strength and long life. This pistol is offered in .45 caliber. MSRP: $800. Tickets for one or both of these firearms can be purchased online. You can also purchase banquet tickets by clicking the ticket below. Tickets for each of the gun raffles is only $20!